The Curatorial Program for Research facilitates an international network of curators, artists and institutions. CPR 2018: Dimming the Northern Lights is a 4-week intensive curatorial research residency that will invite 8 international curators in August 2018 to visit Faroe Islands, Finland, Iceland, Norway, and Sweden. The fully-funded fellowships allow curators to participate supporting also travel costs. The open call promotes equal access to knowledge and international networks and its programming is organized by CPR founding Director Carmen Ferreyra and Program Manager Emily Crain with the following key specialists in each city: Edda Kristín Sigurjónsdóttir, Reykjavik; Johan Martin Christiansen, Tórshavn; Ina Otzko, Tromsø; Arch. Sandi Hilal, Boden; Hannah Isaksson, Luleå; Nestori Syrjälä, Hyrynsalmi; Juha Huuskonen, Helsinki. Additionally, CPR has established local collaborations to create program content with additional artists, curators and institutions that will allow each program day to reach into the Nordic art scenes. Through the expertise of these key local collaborators, curators will partake in a conceptually connected program of daily visits to artist studios and art institutions where they will get an immersive introduction to the artistic practice, production, and dissemination in the host cities and an opportunity to connect with peers. The program is complemented by readings about local socio-political history (chosen by the local experts) that reflect on each city’s isolated cultural and burgeoning art scenes, remaining out of reach, due contemporary art programs focussing on established centers and cities such as London and New York. The theme of the program will offer curators the chance to explore remote spaces and times throughout the Nordic region to address the complex subject of integration. We will tackle two sides of integration: social and behavioral. Social integration stands for the act of incorporating individuals from different groups into a society as equals, while behavioral integration is when an individual stands in harmony with the environment. For example, we will examine the social integration of the Sami population, and we will dive into the intersections of art and ecology, visiting and speaking with artist residencies that focus on the remote nature of their surroundings and how this plays with behavioral integration. The Baltic Sea, curators-in-residence conducted a public presentation about their curatorial practice to a full house of locals at IASPIS in Stockholm. This was an excellent chance for our international residents to be known locally, and to establish relationships with regional and international artist residents. Furthermore, IASPIS is now partnering with CPR for this upcoming program. Following the residency, curators submit a proposal drawing from their work during the program. The proposals advance the connections made during the residency, and must include a collective exhibition in their country of origin, including work of artists visited in each of the cities during the program. One project will be awarded up to USD 10,000 to conduct their proposed exhibition in their country of origin. CPR will also publish a catalogue, giving introduction to other proposed projects as well as information about the completed program. CPRDNL will connect international curators with Nordic artists and institutions. CPR’s past program in the region has already resulted in 6 Nordic artists being featured in exhibitions around the world. Ultimately, the program proves to promote Nordic artists around the globe. Paulina Ascencio (Mexico, b. 1988) is an independent curator and researcher based in Mexico. She graduated from Philosophy and Social Sciences. She participated in the residency programs of Kadist Foundation, San Francisco, and PAOS, Guadalajara, and was part of the Curatorial Intensive program of Independent Curators International (ICI) in New Orleans. She has worked in exhibitions in Museo de Arte de Zapopan, Instituto Cultural Cabañas, and MURA, as well as in galleries and independent spaces in Mexico and the United States. In 2015 she started Archivo MMXV, an ongoing sociological project. Her texts have been published in La Tempestad, Terremoto, and Código. Marten Esko (Estonia, b. 1990) works as curator, writer and manager. He holds an MA in Art History and Visual Culture from the Estonian Academy of Arts (EAA). He is currently the manager of the Contemporary Art Museum of Estonia (EKKM) in Tallinn and is one of the board members of the Tallinn Print Triennial and one of the founders of NGO New Material, a non-periodical magazine publishing. He worked as an assistant curator at EKKM since 2011, joined the board of the museum in 2015 and took over the management of EKKM with Johannes Säre from 2016. Since 2014 he has been a member of the editorial board of the NGO New Material that published its first edition titled New Material in 2014 and the second edition titled New Number in 2016. One of his latest curatorial projects was a collaboration with the artist Mihkel Ilus at the Tallinn Art Hall Gallery, titled Dead End (2016), for which he published a collection of context-free writings under the same title, as part of the continuously changing format of works on view. In 2018 he defended his MA thesis ‘Contemporary art’ in Estonia: notional problematics at the EAA. HIAP in Helsinki and Ateliê397 in São Paulo. His articles, interviews, and essays have appeared in art magazines such as Artribune, DROME magazine, TemporaryArtReview, and DOMUS, as well as in exhibition catalogues for major museums including MADRE in Naples and GAMeC in Bergamo. Siân McIntyre (Australia, b. 1984) is a Sydney based curator and artist. She graduated with first class honours from Bachelor of Fine Arts in 2009, was a founding director of The Paper Mill space in 2010 - 2012, completed a practicum exchange at Glasgow School of Art in 2013, graduated from a Master of Fine art in 2015, was board member of Runway Experimantal Art Magazine from 2015-2017 and has been Director of Verge Gallery since 2014. Siân’s research, curatorial and fine art practice is rooted in formal and social archives, curating exhibitions that act as an opportunity to engage with histories and lived experience through a combination of exhibition and public programming. She specialises in creating spaces where viewers can explore and engage with ideas, experiences, and sometimes difficult or confronting subject matter in alternative ways. Siân has worked as consultant, adviser, editor and lecturer across a broad range of creative and academic positions, including ongoing work at Papunya Tjupi Art Centre in Australia’s Northern Territory since 2009. Siân has exhibited and curated exhibitions in Sydney, Darwin, Melbourne, New York, Glasgow, San Francisco and Sweden. Island' (within TBA21's 'Open Ocean Space x COP23', Bonn and Laznia Centre for Contemporary Art, Gdansk, Poland, 2017); ‘Adrian Paci: A State of Temporary Permanence’ (Kino Mediteran, Bol, Croatia, 2016); ‘Vertical World – approaching gravity’, (General Public, Berlin, 2012); ‘Un Lugar Habitable es un Evento’ (Centro Cultural Facultad de Artes, Medellín, Colombia, 2012). and media art and a co-leader of projects exploring gender aspects of intangible industrial heritage. In her research in the field of visual art and anthropology Vene constantly rethinks the role of visual media in translating elements of culture and everyday life by means of the formats of documentary film and photography (such as, image/visual ethics, self-reflexive practices in film making, sensory ethnography, politics of representation, relationships between Us and Them, advocacy in visual research, participatory and community art practices). Communication from the University of Copenhagen. EMILY CRAIN LOPEZ is a human rights activist and writer based out of Mexico City. She has a B.A. in Peace Studies and Sociology from Chapman University in Southern California, and an M.S. in International Development with a specialization in Gender from New York University. She is originally from California and has done human rights work and research around the globe in Europe, Asia, Africa and the Americas. Her work focuses on the intersection of feminism, gender politics and development. Emily is passionate about advancing opportunities for access to education, art, and culture on a global scale. She spent time working with nonprofits in South Africa and Nicaragua, dedicating time with after school programs that promote art, music and leadership skills. She worked as a Program Manager at an International Labor Rights nonprofit in New York City that implements an international human rights standard for the workplace. CARMEN FERREYRA is an independent curator and art producer based in Brooklyn, NY. She completed her MA in Critical and Curatorial Studies in Modern Art at Columbia University in 2013, and in 2010 earned a BA in Art History and French also from Columbia University. Since February 2015, Ferreyra is the Director and Founder of the Curatorial Program for Research (CPR). Ferreyra was the Director of Special Programs for the Bienal de las Fronteras in Matamoros, Mexico (2014-2015), and the Director of UNTITLED. Art Fair in Miami Beach, Florida (2014). She was the manager of Pinta Art Show in London and New York (2007-2013) and acquisition advisor for Mundus Novus Latin American Art Collection (2010-2013). Additionally, she served as editor at Interventions, Columbia University Curatorial Journal from 2012-2013. Ferreyra has conducted research for several institutions, including the Study Center at the Museu d’Art Contemporani de Barcelona, the Solomon R. Guggenheim Museum in New York, the Whitney Museum of American Art, El Museo del Barrio and the Colección Patricia Phelps de Cisneros in New York, between others. She has served as juror for CEC Artslink residency program in the US for artists based in Central Asia and Eastern Europe, was guest lecturer on Curatorial Practice and Latin American Art at Pratt Institute and at the School of Visual Arts. As Director of CPR, Ferreyra has designed, produced and supervised six research residencies with 50 fully funded curatorial fellowships in 28 cities around the world. After a very suggestive train ride from Narvik to Kiruna, the group arrives in town. 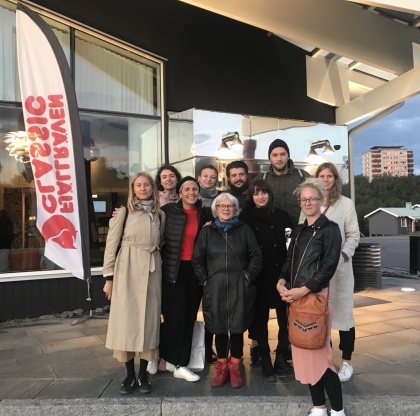 The curators have the opporunity to discover the local art scene, having a talk with the artist Britta Marakatt Labba and meeting Selma Green, director of Konstmuseet i Norr. The visit continues with a guided tour of the city with Rasmus Norling, building conservator, and with a conversation with LKABs General Manager, Anders Lindberg. The Esrange Space Center explains the ongoing research up North. Ingrid Inga, chairman for the culture department at the Sami Parliament, and Nils-Johan Labba, member of the culture department at the Sami Parliament and master in duodji handicraft, introduce everyone to Sami culture and current work. Nature is explored through the Midnight Sun Trail. The first stop is in Porjus, where the curators have access to the local hydroelectric power station. After a tour inside the Ajtté museum, in Jokkmokk, the group visit Anders Sunna´s and Katarina Pirak Sikku studio. On the way to Boden, Harads hosts the beautiful Tree Hotel, where the curators have dinner. One in Boden, the group has the opportunity to visit Havremagasinet and the Living Room, a project by the architect Sandi Hilal. Moreover, they have access to Rödbergsfortet, a top-secret military fortress, now become a privately run museum. After a guided tour of Norrbottens Museum, the group moves towards Galleri Syster, where the curators meet a group of local artists. During the afternoon they have time to go around the city.